Dendritic cells are a phenotypically diverse group of APC that have unique capabilities to regulate the activity and survival of B and T cells. Although proper function of dendritic cells is essential to host control of invading pathogens, few studies have examined the impact of sepsis on dendritic cells. The purpose of this study was to determine the effect of sepsis on splenic interdigitating dendritic cells (IDCs) and follicular dendritic cells (FDCs) using a clinically relevant animal model. Immunohistochemical staining for FDCs showed that sepsis induced an initial marked expansion in FDCs that peaked at 36 h after onset. The FDCs expanded to fill the entire lymphoid zone otherwise occupied by B cells. Between 36 and 48 h after sepsis, there was a profound caspase 3 mediated apoptosis induced depletion of FDCs such that only a small contingent of cells remained. In contrast to the initial increase in FDCs, IDC numbers were decreased to ∼50% of control by 12 h after onset of sepsis. IDC death occurred by caspase 3-mediated apoptosis. Such profound apoptosis induced loss of FDCs and IDCs may significantly compromise B and T cell function and impair the ability of the host to survive sepsis. Sepsis is a highly lethal disorder that is responsible for the deaths of over 200,000 people annually in the United States alone (1). A number of studies in both animals and patients have established that in sepsis there is a progressive and profound loss of CD4 T and B cells (2, 3, 4, 5). Despite the importance of splenic dendritic cells, there has not been a great deal of investigation into the effect of sepsis on these Ag-presenting elements (6). This lack of research is most likely because of technical difficulties in identification and isolation of different dendritic cell subsets (7, 8, 9). Dendritic cells play diverse and important roles in the host response to invading pathogens (8, 9, 10). They express large amounts of both MHC and costimulatory molecules, enabling them to be the premier APC of the immune system (7, 9, 10). Dendritic cells are instrumental in activation of T cells and direct CD4 T cells toward a Th1 or Th2 pattern of cytokine expression (11). Dendritic cells also stimulate B cells to increase Ab production and to proliferate. Follicular dendritic cells (FDC)3 in particular, directly sustain the viability, growth, and differentiation of activated germinal B cells (12, 13, 14). In addition to important roles in proliferation and activation of T and B cells, dendritic cells may also act to eliminate selected T and B cells via Fas-mediated apoptosis (12, 13, 14). Thus, the extensive loss of T and B cells that occurs in sepsis could be partly mediated by dendritic cells. The life span of dendritic cells varies depending both upon the type of dendritic cell and its function (15, 16, 17). It is speculated that some dendritic cells may persist for years, maintaining immunologic memory by persistent Ag presentation (14, 16). Conversely, the life span of other dendritic cells may be brief, lasting only 3–4 days (16). In mice that have been challenged with an Ag to which they have been sensitized, kinetic studies indicate that dendritic cells undergo rapid turnover after Ag presentation to T cells (10). It has been postulated that activated dendritic cells are eliminated to prevent continued T cell activation and an uncontrolled inflammatory response (10). In the present study, we utilized a widely used, clinically relevant mouse model of sepsis to examine the impact of sepsis on follicular and interdigitating dendritic cells (IDCs). Dendritic cells were examined at multiple time points in septic and control animals, and the presence and prevalence of active caspase 3 mediated apoptosis was assessed. All mice used in the study were purchased from The Jackson Laboratory (Bar Harbor, ME) and were on a C57BL6 background. The cecal ligation and puncture (CLP) model of sepsis developed by Chaudry et al. (18) and modified as previously described (5) was used to induce intraabdominal sepsis. As formerly reported, blood cultures were positive for numerous aerobic and anaerobic Gram-positive and Gram-negative bacteria in CLP but not sham operated mice (5, 19). Mice were anesthetized with halothane and a midline abdominal incision was made. The cecum was mobilized, ligated below the ileocecal valve, and punctured with a 25-gauge needle. The abdomen was closed in two layers, and the mice were injected s.c. with 1.0 ml of 0.9% saline. Sham-operated mice were handled in the same manner, except that the cecum was not ligated or punctured. Animal studies were approved by the Animal Studies Committee at Washington University School of Medicine (St. Louis, MO). Mice were killed at 6, 24, 36, and 48 h after CLP and sham surgery. Spleens were obtained and immediately placed in liquid nitrogen. Specimens were quickly frozen in OCT media and cryosectioned in 10 μm sections then immediately fixed in ice-cold acetone for 4 min before storage at −80°C. All staining was done at room temperature in a humidified chamber. Dilutions and washings were done in PBS + 1% BSA. Currently, there is no commercially available Ab for use in isolating FDCs for study via flow cytometry. Consequently, FDCs were studied via immunohistochemical staining in frozen spleen specimens. A minimum of two to four sham and four to six septic mice were studied at each time point. A rat anti-mouse FDCs Ab (clone FDC-M1, catalog number 551320; BD PharMingen, San Diego, CA) specifically formatted for immunohistochemical staining was used at a concentration of 1/30. The secondary, Alexa Fluor 594 goat anti-rat, was purchased from Molecular Probes (Eugene, OR) and diluted 1/400. For colocalization studies with CD3 the secondary used was Alexa 488 at a concentration of 1/200. A purified hamster anti-mouse CD11C, integrin αχ chain, (BD PharMingen, catalog number 550283) was used at a dilution of 1/20. After incubation with the primary Ab, the slides were incubated with a Texas Red conjugated AffiniPure Goat anti-Armenian Hamster IgG (Jackson ImmunoResearch Laboratories, West Grove, PA) diluted 1/75 for 30 min. Purified hamster anti-mouse CD3ε, clone 145-2C11 (BD PharMingen) was used at a concentration of 1/50. Following washing, an anti-hamster secondary Ab conjugated with Texas Red was used at a concentration of 1/75. FITC-conjugated rat anti-mouse mAb (BD PharMingen, catalog number 553087), clone RA3-6B2, was used at a dilution of 1/20. A monoclonal rat anti-mouse CD19 Ab, clone ID3 (BD PharMingen, catalog number 550284) was used at a concentration of 1/50. For detection of the primary Ab, an Alexa 594 fluorophore secondary (Molecular Probes) was added at a concentration of 1/300. The primary rat anti-mouse Ab clone CI:A3-1 (F4/80) (Serotec, Raleigh, NC) (1/50 dilution) was used to detect macrophages. The secondary Ab was an Alexa 594 (Molecular Probes) anti-rat Ab (1/300 dilution). Frozen spleen sections were stained for active caspase 3 using a polyclonal Ab (1/100 dilution) that is specific for the active form of caspase 3 (Cell Signaling Technology, Beverly, MA). An Alexa 488 goat anti-rabbit secondary Ab (Molecular Probes) was used at a concentration of 1/1000 to detect the primary Ab. Flow cytometry was used to determine the effects of sepsis on IDCs because a positive immunomagnetic selection method is available and results are readily expressed in a quantitative manner. The manufacturer’s protocol (Miltenyi Biotec, Auburn, CA) was used for isolation and identification of IDCs by flow cytometry and is described briefly. The isolated spleen was minced and treated with Collagenase D. The cells were incubated on a plastic dish for 1 h (to reduce the number of macrophages by adherence). Anti-CD11c magnetic microbeads were added to the cell suspension followed by separation using magnetic columns. 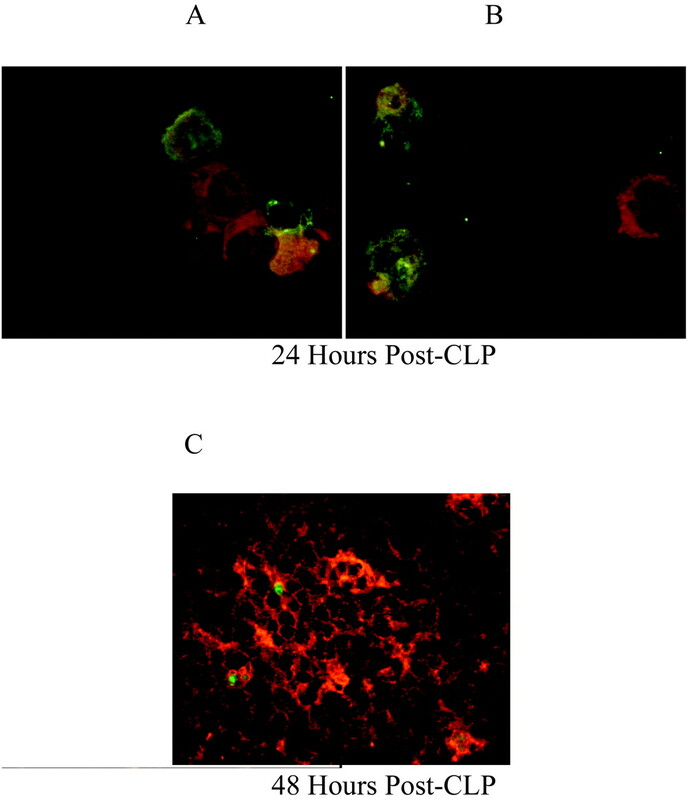 Next, a fluorescein labeled anti-CD11c and a PE labeled anti-MHC class II Ab were applied. Positive staining on the selected dendritic cells was identified using a FACSCalibur (10,000 events/sample) and cells that were positive for both CD11c and MHC II were considered to be IDCs. To calculate the absolute number of cells, an aliquot of the cell suspension (obtained before immunomagnetic separation) was used to calculate the total number of cells. To calculate the number of IDCs, identified by the CD11c+/MHC II+ staining, the total number of cells obtained by positive selection was multiplied by the percentage of dendritic cells obtained by flow cytometry. Next, the percentage of IDCs in the total cell population was determined by dividing the number of CD11c+/MHC II+ cells by the total cell number obtained before purification. Fluorescently labeled spleen specimens were examined using a Nikon Eclipse E600 microscope equipped with filter cubes selective for FITC, Texas Red, and DAPI. A dual filter cube for FITC/Texas Red was used to detect simultaneous labeling of specimens stained with Abs conjugated with FITC or Texas Red. A minimum of 5–10 high-powered fields (×100) were evaluated in each sample. Data are reported as the mean ± SEM. Data were analyzed using the statistical software program Prism (GraphPad Software, San Diego, CA). For comparison between two groups, a paired Student’s t test was used. Differences were considered significant for p < 0.05. Histologic examination of the follicular structures in spleens stained with anti-FDC Abs demonstrated a typical meshwork-like pattern (15) of cells with the characteristic features of dendritic cells (Fig. 1⇓): spindle or stellate morphology with dendritic cytoplasmic processes. Sepsis caused an expansion of FDCs that started after 6 h and reached a maximum at ∼36 h after CLP. Initially, i.e., between time zero and 6 h after sepsis, the FDCs occupied only the central portion of the B cell dependant lymphoid zone (including well-formed germinal centers) (Figs. 2⇓ and 3⇓). However, by 24 h, the FDCs had markedly increased and the distribution of FDCs had clearly expanded more globally into B cell zones, including the follicle mantle and marginal zone (Fig. 3⇓, vide infra). By 48 h after CLP, there was a marked decrease in the expansion of FDCs and only a few FDCs and their dendritic processes remained (Figs. 2⇓ and 3⇓). The pre-septic zonal relationship of FDCs to the B cell follicle was no longer evident. Comparison of the FDCs in the sham operated mice showed no significant change over time. To verify the specificity of the FDC-M1 Ab, a non-specific idiotype matched control primary Ab was also used with the Alexa Fluor 594 goat anti-rat secondary. There was no staining of cell bodies or dendritic processes with this negative methodologic control. We performed immunohistochemical staining for B cells (anti-B220 Ab) to confirm that the expansion in FDCs was occurring within B cell dependent lymphoid zones and to determine the relationship between FDCs and B cells in these zones during sepsis. Immunohistochemical staining for B cells after sepsis showed that FDCs compartment expanded to fill B cell defined areas (Fig. 3⇑). Importantly, there was no colocalization of the FDCs and B220 immunohistochemical stains. In other words, cells that were positive for FDCs were negative for B220. The B220 immunohistochemical findings were verified using an alternate B cell marker (CD19) which provided comparable results. Other key cellular components of splenic lymphoid tissue are T lymphocytes. To examine the relationship of T cells and FDCs, an anti-CD3 Ab was used. Immunohistochemical staining showed (as expected) that there were heavy concentrations of T cells in the periarteriolar sheath region (Fig. 4⇓A). Scattered T cells were also present within B cell-dependent lymphoid zones, but these cells were much less numerous than FDC-positive elements. To demonstrate that FDC-reactive cells were not macrophages, frozen spleen sections were stained for the anti-macrophage Ab F4/80. Results showed that F4/80-positive cells had a typical macrophage morphology, i.e., the cells were larger and more irregularly shaped compared with the smaller round lymphocytes and they had larger nuclei and an open chromatin pattern (Fig. 4⇑B). Importantly, F4/80 reactive cells were concentrated in the marginal sinus and red pulp and were only rarely present in the germinal centers (Fig. 4⇑B). Flow cytometry for IDCs showed that there was no significant difference in the percentage of splenic IDCs in sham operated mice at 12 vs 24 h. Therefore, these values were combined for analytic purposes. The percentage of dendritic cells in spleens from sham operated mice was 0.91 ± 0.14%; the percentages of dendritic cells in spleens from septic mice were 0.40 ± 0.05% and 0.46 ± 0.09% at 12 and 22 h respectively, a statistically significant difference (p < 0.05) (Fig. 5⇓). Flow cytometric analysis of IDCs. Mouse spleens were obtained 12 h after sham or septic surgery and IDCs obtained by positive immunomagnetic selection; see Materials and Methods. Flow cytometry was performed and IDCs identified both by forward and side scatter as well as expression of CD11c and MHC II; see Materials and Methods. The data presented is gated on forward and side scatter. Note the decrease in the number of IDCs (present in upper right hand quadrant) in the septic vs sham spleen. (10,000 events counted). In the control mouse, ∼75% of the purified cells within the dendritic cell gate by forward and side scatter expressed both CD11c and MHC II. In contrast, in the septic mouse, only ∼57% of the cells met these criteria. Spleens from septic and sham operated mice were stained for active caspase 3 at 24 h after surgery. Active caspase 3 was positive in many cells in the splenic follicles from both sham and septic mice, although the number of positive cells was much greater in spleens from septic vs sham mice. 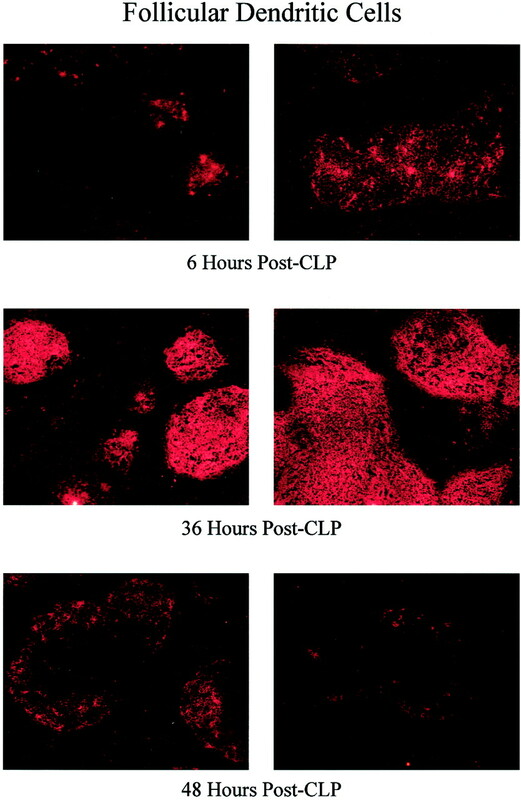 Examination of specimens using fluorescence microscopy and a dual filter cube (to observe for simultaneous green and red fluorescent emissions) revealed cells that were positive for active caspase 3 alone (green fluorescence), cells positive for the FDC marker (red fluorescence) alone, and cells positive for both active caspase 3 and FDC marker (yellow fluorescence) (Fig. 6⇓C). Cells that were positive for both FDCs and active caspase 3 (yellow fluorescence) had dendritic morphology, i.e., spindle shaped cells with processes. 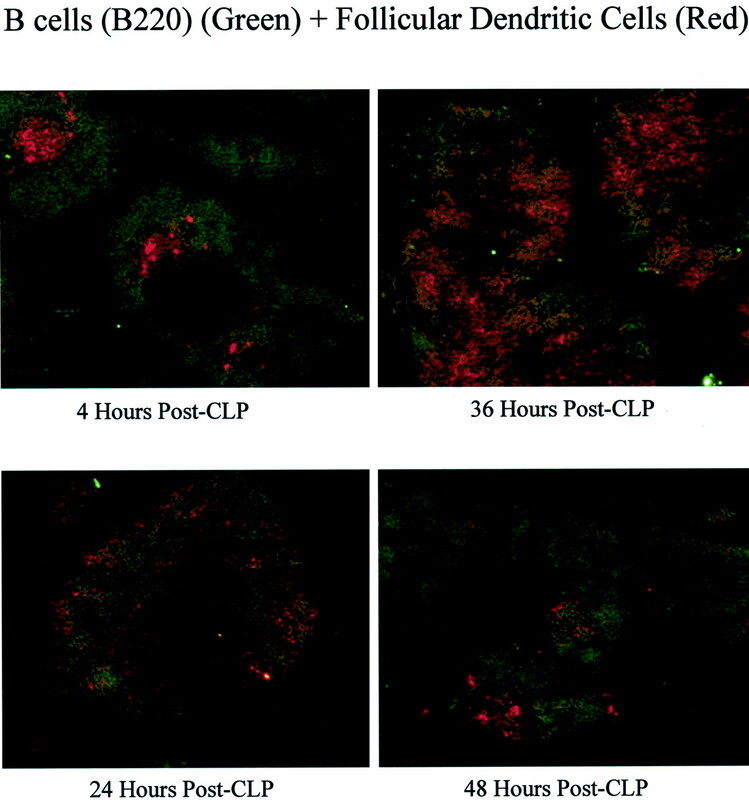 The cells that were positive for active caspase 3 but negative for the FDC marker (red fluorescence) had morphology typical of small lymphocytes. The nuclei in these active caspase 3 cells were frequently compacted and fragmented. Those regions of the spleen that had large concentrations of cells positive for the FDC marker were evaluated for the percentage of cells that were also positive for active caspase 3 (×400–600 magnification) using an image analysis program, (Metamorph, Universal Imaging, West Chester, PA). Focally, ∼1.7% of FDCs were positive for active caspase 3 at 36–48 h after CLP (n = 7). In sham operated mice only a rare single FDC was positive for active caspase 3. IDCs that had been isolated using magnetic cell sorting were concentrated onto microscope slides using standard cytospin and stained for both active caspase 3 and CD11c. Similar to the results for the FDCs, examination of specimens using fluorescence microscopy and a dual filter cube for detection of red and green fluorescence showed cells that appeared red, green, or yellow corresponding to the different fluorescently labeled Abs (Fig. 6⇑, A and B). 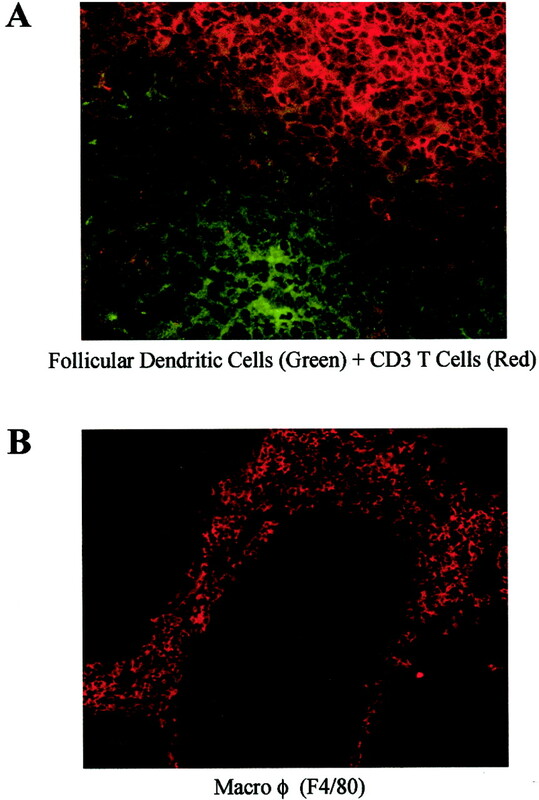 Cells positive for active caspase 3 alone appeared green; cells positive for CD11c alone appeared red; cells positive for both active caspase 3 and CD11c (representing apoptotic IDCs) appeared yellow. Cells that appeared green alone most likely represented contaminating lymphocytes that had not been completely removed by the isolation procedure. The most dramatic finding in the present study was the remarkable expansion in FDCs early in sepsis followed by their profound depletion by 48 h after onset of sepsis (Figs. 2⇑ and 3⇑). To our knowledge, this expansion and contraction of FDCs has not been previously reported for any clinically relevant condition. The cells that stained positive for the FDC marker had typical dendritic cell morphology (15). None of the cells that stained positive for the FDC marker were positive for the B220 marker, thereby indicating that the FDC marker was not falsely positive for B cells. Furthermore, cells that were positive for the FDC immunohistochemical stain were located within the follicle and were anatomically distinct from cells that were positive for the macrophage F4/80 or CD3 T cell immunohistochemical markers. In contrast to the initial expansion in FDCs, there was an early decrease in the number of IDCs beginning at 12 h after sepsis. There is no ready explanation for the unique responses of FDCs vs IDCs although developmental or functional differences of these two dendritic cell types may in part be responsible (14, 21, 22, 23, 24, 25). 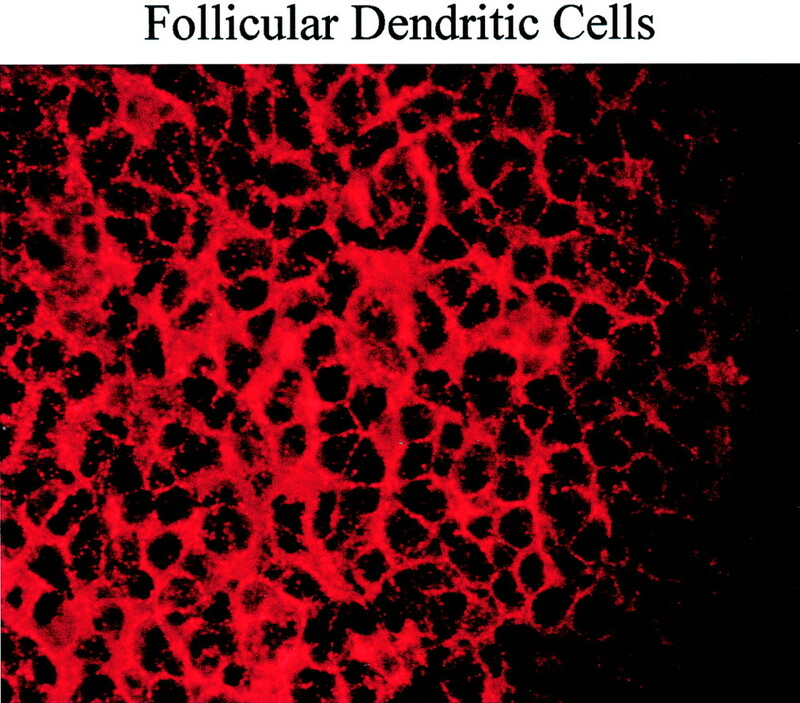 FDCs differ from IDCs in that they are not bone marrow derived and display a unique set of cell surface molecules (7, 25). FDCs are highly efficient stimulators of B cells while IDCs primarily activate T cells (23, 25). FDCs form a rich network within and probably help organize the active centers of B cell zones in lymphoid tissue (7, 8, 9, 21, 22, 23, 24). These cells also have the capacity to take up Ag and hold it on their surface for periods of more than a year. The present findings show that with the onset of sepsis, there is expansion of FDCs throughout the B cell dependent zone of splenic lymphoid tissue (including both mantle and marginal zones). However, this expansion is short-lived and by 48 h after onset of sepsis, only a small number of FDCs remain anywhere in the follicle and few of these persist in native FDC zones. Immunohistochemical staining for active caspase 3 showed that both FDCs and IDCs were dying by apoptosis. Although there have not been extensive studies of apoptosis of FDCs, kinetic studies in mice have demonstrated that IDCs undergo rapid turnover after presentation of Ag to T cells (10, 16). IDCs that have been activated by Ag capture and processing are programmed to die unless they receive a survival signal from T cells (10). Kamath et al. (16) examined the turnover of various dendritic cell subsets and reported that splenic CD4−8+ dendritic cells had a half-life of 1.5 days while the half-lives of CD4−8− and CD4+8− dendritic cells were 2.0 and 2.9 days respectively. Investigators have speculated that the rationale for the short half-life of activated IDCs is to provide a brake for the immunologic response and thereby prevent uncontrolled immune activation (10). The present findings are consistent with previous work from our laboratory wherein spleens from patients who died of sepsis (most after a prolonged illness) exhibited extensive loss of FDCs and IDCs (26). In the latter investigations, we did not evaluate dendritic cell apoptosis. Nevertheless, based on the present analysis in a murine model, we believe that dendritic cell loss in humans was also due to apoptosis. There is extensive cross talk between dendritic cells and lymphocytes. FDCs act via a number of mechanisms, among them the secretion of IL-7 to sustain the growth, viability, and differentiation of B cells (22, 23, 24). Conversely, dendritic cells express Fas ligand and can eliminate unwanted follicular B cells and T cells (27). Just as FDCs are needed for B cell follicular growth, B cells are necessary for the appearance of FDCs within the follicle. Rodents that are depleted of B cells from birth by treatment with anti-IgM Abs have no FDCs. Flow cytometric analysis of splenic B cells demonstrates that during sepsis ∼15–25% of B and T cells are undergoing apoptosis (5, 19). Patients who die of sepsis have extensive loss of B cells with marked decreases in both the size and number of splenic follicles (28). Thus, loss of B cells during sepsis could contribute to the death of FDCs. It is important, then, to ask whether there is a potential causal relationship between the loss in lymphocytes and dendritic cells. In other words, does the loss in dendritic cells result in a subsequent loss in follicular B cells and T cells or, is the reverse situation true, i.e., does the loss in B and T cells induce a loss in dendritic cells? The present findings do not provide definitive answers to this question. The loss of FDCs and IDCs documented in the present study may have profound effects on the ability of an animal to survive sepsis. Dendritic cells play a crucial role in protecting the host against pathogens (7, 9, 25). In addition to their roles as Ag presenting cells, dendritic cells make a number of cytokines that activate cells of the innate and adaptive immune system. For example, dendritic cells secrete IL-12 which is a potent stimulator of macrophages and natural killer cells. Recently, dendritic cells were also found to make IL-2 which activates both T and B cells (22). FDCs present unprocessed Ag and check B cell clones for higher affinity. FDCs kill B cell clones that are unsuited for optimal humoral immune responses. Therefore, we speculate that the loss in dendritic cells may significantly impair the ability of a septic patient to eradicate infection and predispose him/her to secondary infections. It is noteworthy that the profound loss in FDCs that occurs between 36 and 48 h after sepsis temporally correlates with the time period of maximum mortality in the cecal ligation and perforation model of sepsis, i.e., 24–48 h after onset (5, 19). Recent work by Oberholzer et al. (6) demonstrated improved sepsis survival in mice injected with dendritic cells expressing IL-10, emphasizing the important role of dendritic cells in orchestrating the host response to sepsis. One potential limitation of the present study is our inability, in principle, to distinguish between actual loss of FDCs and IDCs and the selective loss of reactivity for (or expression of) FDC-M1 and CD11c, respectively. Although we speculate that the changes in FDCs and IDCs are due to changes in the actual number of dendritic cells, it is possible that differences in expression of these cell surface markers occurring during cellular activation could also be playing a role. Currently, however, there are no reports of changes in cellular expression of these particular dendritic cell markers with changes in cellular activation. Also, as noted previously, FDCs are not reported to occupy the entire germinal center of the follicle (20). Thus, our findings documenting expansion of dendritic cells throughout the B cell region of the follicle are unlikely to be due to increased cell surface expression of the FDC-M1 Ag. The observations that many of the dendritic cells are undergoing caspase 3 mediated apoptosis indicates that cellular ‘turnover’ is involved at least to some degree in the observed changes in cell populations. Moreover, the distinction between loss of cells and loss of cell-specific Ag expression may be of limited significance, given that the latter might well reflect a change in functional states that heralds a qualitative loss of FDCs and IDCs. Finally, although we speculate that the loss of dendritic cells is detrimental in sepsis, it is also possible that either a quantitative or qualitative loss in dendritic cells may have unrecognized beneficial effects by modulating the inflammatory/immunologic response and preventing uncontrolled activation and cell injury. In summary, sepsis induces a major loss in IDCs and FDCs via caspase 3 mediated apoptosis. The death of dendritic cells may be an important mechanism of immune suppression in sepsis and may contribute to the morbidity and mortality of this lethal disorder. ↵1 This work was supported by National Institutes of Health Grants GM44118 and GM55194 and by the Alan A. and Edith L. Wolff Foundation. ↵3 Abbreviations used in this paper: FDC, follicular dendritic cell; IDC, interdigitating dendritic cell; CLP, cecal ligation and puncture. Angus, D. C., W. T. Linde-Zwirble, J. Lidicker, G. Clermont, J. Carcillo, M. R. Pinsky. 2001. Epidemiology of severe sepsis in the United States. Crit. Care Med. 29:1303. Ayala, A., C. S. Chung, Y. X. Xu, T. A. Evans, K. M. Redmond, I. H. Chaudry. 1999. Increased inducible apoptosis in CD4+ T lymphocytes during polymicrobial sepsis is mediated by Fas ligand and not endotoxin. Immunology 97:45. Ayala, A., C. D. Herdon, D. L. Lehman, C. A. Ayala, I. H. Chaudry. 1996. Differential induction of apoptosis in lymphoid tissues during sepsis: variation in onset, frequency, and the nature of the mediators. Blood 87:4261. Chung, C. S., W. Wang, I. H. Chaudry, A. Ayala. 2001. Increased apoptosis in lamina propria B cells during polymicrobial sepsis is FasL but not endotoxin mediated. Am. J. Physiol. Gastrointest. Liver Physiol. 280:G812. Hotchkiss, R. S., K. C. Chang, P. E. Swanson, K. W. Tinsley, J. J. Hui, P. Klender, S. Xanthoudakis, S. Roy, C. Black, E. Grimm, et al 2000. Caspase inhibitors improve survival in sepsis: a critical role of the lymphocyte. Nat. Immunol. 1:496. Oberholzer, A., C. Oberholzer, K. S. Bahjat, R. Ungaro, C. L. Tannahill, M. Murday, F. R. Bahjat, Z. Abouhamze, V. Tsai, D. LaFace, et al 2002. Increased survival in sepsis by in vivo adenovirus-induced expression of IL-10 in dendritic cells. J. Immunol. 168:3412. Satthaporn, S., O. Eremin. 2001. Dendritic cells (I): biological functions. J. R. Coll. Surg. Edinb. 46:9. Reis e Sousa, C., A. Sher, P. Kaye. 1999. The role of dendritic cells in the induction and regulation of immunity to microbial infection. Curr. Opin. Immunol. 11:392. De Smedt, T., B. Pajak, G. G. Klaus, R. J. Noelle, J. Urbain, O. Leo, M. Moser. 1998. Antigen-specific T lymphocytes regulate lipopolysaccharide-induced apoptosis of dendritic cells in vivo. J. Immunol. 161:4476. Moser, M., K. M. Murphy. 2000. Dendritic cell regulation of TH1-TH2 development. Nat. Immunol. 1:199. Ronchese, F., I. F. Hermans. 2001. Killing of dendritic cells: a life cut short or a purposeful death?. J. Exp. Med. 194:F23. Hur, D. Y., D. J. Kim, S. Kim, Y. I. Kim, D. Cho, D. S. Lee, Y. Hwang, K. Bae, K. Y. Chang, W. J. Lee. 2000. Role of follicular dendritic cells in the apoptosis of germinal center B cells. Immunol. Lett. 72:107. McLellan, A. D., E. Kampgen. 2000. Functions of myeloid and lymphoid dendritic cells. Immunol. Lett. 72:101. Hollmann, C., J. Gerdes. 1999. Follicular dendritic cells and T cells: nurses and executioners in the germinal centre reaction. J. Pathol. 189:147. Shortman, K.. 2000. Burnet oration: dendritic cells: multiple subtypes, multiple origins, multiple functions. Immunol. Cell Biol. 78:161. Chaudry, I. H., K. A. Wichterman, A. E. Baue. 1979. Effect of sepsis on tissue adenine nucleotide levels. Surgery 85:205. Hotchkiss, R. S., K. W. Tinsley, J. J. Hui, K. C. Chang, P. E. Swanson, A. M. Drewry, T. G. Buchman, I. E. Karl. 2000. p53-dependent and -independent pathways of apoptotic cell death in sepsis. J. Immunol. 164:3675. MacLennan, I. C.. 1994. Germinal centers. Annu. Rev. Immunol. 12:117. Liu, Y. J., H. Kanzler, V. Soumelis, M. Gilliet. 2001. Dendritic cell lineage, plasticity and cross-regulation. Nat. Immunol. 2:585. Lebecque, S.. 2001. A new job for dendritic cells. Nat. Immunol. 2:830. Anjuere, F., P. Martin, I. Ferrero, M. L. Fraga, G. M. del Hoyo, N. Wright, C. Ardavin. 1999. Definition of dendritic cell subpopulations present in the spleen, Peyer’s patches, lymph nodes, and skin of the mouse. Blood 93:590. Hotchkiss, R. S., K. W. Tinsley, P. E. Swanson, M. H. Grayson, D. F. Osborne, T. H. Wagner, J. P. Cobb, C. Coopersmith, I. E. Karl. 2002. Depletion of dendritic cells, but not macrophages, in patients with sepsis. J. Immunol. 168:2493. Hotchkiss, R. S., K. W. Tinsley, P. E. Swanson, R. E. Schmieg, Jr, J. J. Hui, K. C. Chang, D. F. Osborne, B. D. Freeman, J. P. Cobb, T. G. Buchman, I. E. Karl. 2001. Sepsis-induced apoptosis causes progressive profound depletion of B and CD4+ T lymphocytes in humans. J. Immunol. 166:6952. Reddehase, M. J.. 2002. Antigens and immunoevasins: opponents in cytomegalovirus immune surveillance. Nat. Rev. Immunol. 2:831.